Last Monday (March 7) Transcend Coffee opened its newest location, in downtown Edmonton (10349-Jasper Avenue), in the former Axis Cafe building. In addition to their popular coffee, the locally-based brewers will offer a small selection of beer and wine, as well as South American street food prepared in-house by Red Seal chef Chad Moss. The 3-floor outlet will also consider taking advantage of its spacious basement, perhaps a potential venue for live music? The other two Transcend locations are at Garneau (8708-109 St.) and the original Argyll (9869-62 Ave.). Jasper's locale will open its doors each morning at 7:30. Free beer! There, now I have your attention. 46 liters of home-brewed ale will be served to those who pay the 10 bucks to take in Old Ugly Recordings' CD release party for local acts DoT and Layne L'Heureux. The 3-hour shindig will celebrate the brand new acts and their premiere recordings at..."Doug & Mikey's House!" Yep, in fact, you need to email Old Ugly (theyreoldugly@gmail.com) for the address to the concert, which will start at 8:30PM this Saturday (March 19). The show will also feature performances by Caily Fisher, Jessica Jalbert, and Isaac Haines. 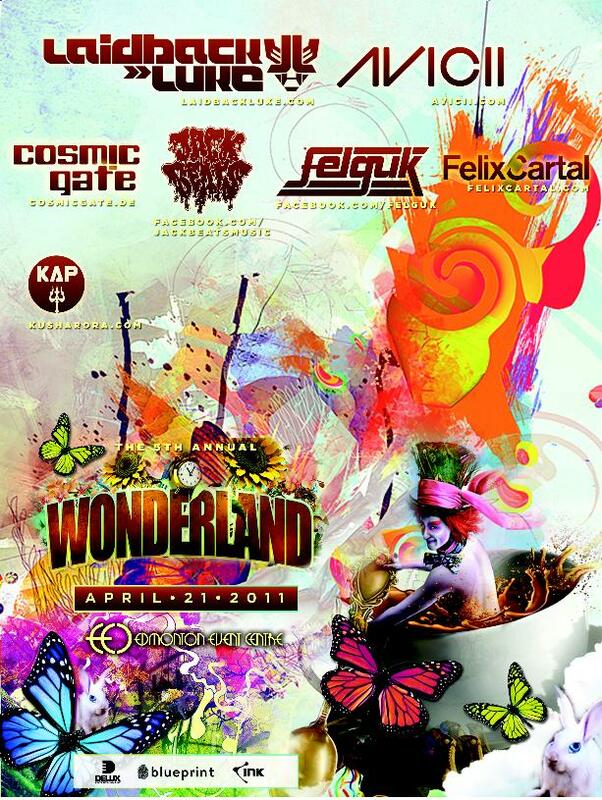 The 5th annual Wonderland Electronic Music Festival, one of the longest-running in Western Canada, will take over the Edmonton Event Centre (West Edmonton Mall) on Thursday, April 21 (Friday is a holiday!) at 9PM. "Wonderland promises to take you through a journey filled with awe inspiring visual effects, decor and sound," they tell us. "We welcome you to join us as the tradition continues; you won't be disappointed!" Tickets are now on sale and go for $47+ and up. The 2011 line-up includes Laidback Luke, AvicII, Cosmic Gate, Jack Beats, Felguk, Felix Cartal, Kush Arora, David Stone, Intricate, Phatcat, Cool Beans, P-Rex, and others. You can check out their Facebook page for more information. The producers of CBC's Dragon's Den were in Edmonton on Saturday (March 12) in hopes to find the next big thing. The show, which scours Canadian entrepreneurs to discover ideas and inventive products to invest in, held dozens of "auditions" at downtown's Westin Hotel. 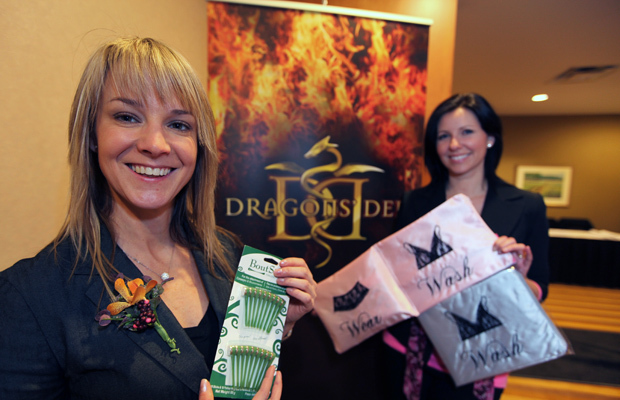 Dragon's Den, the network's 2nd most-watched series, will see up to 200 spots for the sixth season, which will begin to tape in the middle of April. Producers will return to Edmonton on March 30. If you have five bucks to spare and nothing to do on a Tuesday night (March 22, actually), then consider Skitz-O-Frenzie, presented by Belmont Productions. Skip Worthington and Meter Man will make an appearance at downtown's The Hydeaway Comedy Lounge (10209-100 Ave.). Edmonton stand-ups Neil Rhodes and Scott Belford will headline the night of sketch comedy, which begins at 9PM. Doors open at 8:30. Nine-year-old chesapeake bay retriever Toby, a local volunteer rescue k-9 with prior behaviour problems, may potentially become Edmonton's latest movie star. Not that we have many of those. Back in '07 Chris & Charmaine Hammond adopted Toby from foster care, only to discover that his "destructive" and "anxious" behaviour would lead to the professional training sessions that made the Hammond's realize that their pet needed "a purpose." Over the last three years Toby has volunteered every Wednesday at Alberta Hospital, working as a pet-assisted therapy dog to mentally ill patients, as part of The Chimo Animal Assisted Therapy Project. Charmaine put pen to paper and inked out, first, a story of Toby's journey in an '09 edition of Chicken Soup for the Soul, and second, in a book titled On Toby's Terms. That led to a book tour and an actual movie offer from Impact Motion Pictures, out of California. The film project is currently in screenplay territory, and Toby is expected to make a cameo. IMP has also stated that at least part of the film may be shot right here in Edmonton. See the video below. Even though he was here for a comedy gig, Jackass star Steve-O made a quick stop at the Edmonton Valley Zoo on Friday (March 11) to show his support for the whole "Save Lucy the Elephant" debacle. Steve-O, who's real name if Stephen Glover, told local press that he once worked in the circus circuit and adopted an appreciation for the proper care of these animals while there. Steve-O was supporting some of his friends who belong to the PETA organization. For all you folks with the expendable cash (must be nice!) there are a bunch of upcoming concerts you might wanna spend it on, including Born Ruffians and The Ruby Suns @ the Starlite Room on March 17 (Thur/7PM), Fred Eaglesmith @ Century Casino on March 17 (Thur/ 8PM), Electric Six and Birthday Boys @ Starlite on March 18 (Fri/9PM), Nelly @ Edmonton Event Centre on March 19 (Sat/9PM), NOA @ Yardbird Suite on March 20 (Sun/8PM), The Residents @ Myer Horowitz Theatre on March 21 (Mon/8PM), Jeff Dunham @ Rexall Place on March 24 (Thur/7:30PM), Shen Yun @ Jubilee Auditorium March 24-26 (Thur-Sat), Dr. Hook and Ray Sawyer @ Century Casino on March 24 (Thur/8PM), T-Pain @ EEC on March 25 (Fri/9PM), Jackson Browne @ Jubilee on March 28 (Mon/8PM), The Dodos @ Starlite on March 29 (Tues/8:30PM), Alan Jackson @ Rexall on March 30 (Wed/7PM), and Mother Mother @ EEC on March 31 (Thur/7PM). Tickets for all of these events are available at Ticketmaster.